High-grade glass laser optics are now offered for price-sensitive high-volume applications such as LIDAR and ID sensors using a new production method. LIMO has claimed it has become the world’s first manufacturer to successfully process large 300mm x 300mm glass wafers and use the wafers to fabricate cost-effective micro-optics. The company achieved a technology breakthrough to produce 140mm glass wafers for the fabrication of high-precision cylindrical lenses, all without sacrificing any quality at all. After enhancing the technique, the company can now produce 300mm glass wafers (12″ x 12″). Now 25,000 FAC lenses with typical dimensions can be produced from just one of these wafers, as well as other acylindrical lens arrays highlighting consistently high optical quality. The advancements in production technology have reduced the unit costs for high-grade diode laser optics made from glass to levels only seen for low-cost plastic lenses. 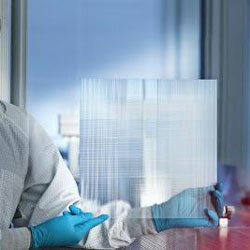 High-quality glass optics can also be employed in price-sensitive consumer and high-volume applications.